A small Terminator® frog helped Ott DeFoe to another big finish Sunday in Bassmaster Elite Series action. Placing a close runner-up on Florida’s famed big-bass factory, Lake Okeechobee, the Rapala® pro threw a New, not yet released Terminator Walking Frog, Jr. to score his second top-10 finish in as many Elite Series tournaments this season. 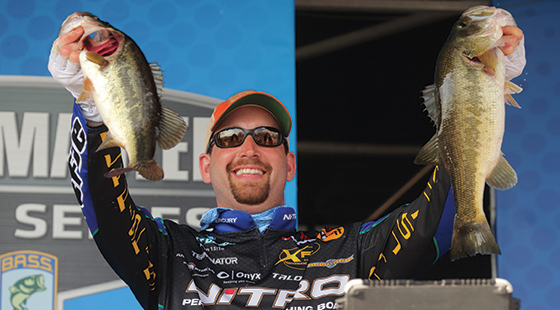 “I was catching fish on it in the mornings on the shad spawn,” DeFoe said on the Bassmaster stage after weighing in 18 pounds, 13 ounces, in the final day of the four-day tournament. The bait, smaller than an original Terminator® Walking Frog and will be available later on this year, was “key,” DeFoe said, because the shad that bass were eating were small. “They seemed to eat that smaller frog better,” he said. “The action is more subtle.” He used two color patterns — Smoke Silver Shad and Cocoa Camo. Many of the other bass DeFoe weighed in the tournament — “especially a lot of the big ones this week,” he said — came on a punch rig armed with a 5/0 VMC® straight shank flippin’ hook. Among the bigguns he boated en route to his runner-up finish were twin 8-pound, 6-ouncers he caught on the first day to take an early lead in the tournament with a five-fish limit weighing a whopping 31 pounds, 3 ounces. One of those beasts came on a Terminator Popping Frog, a larger and cup-faced older cousin of the Walking Frog Jr. He used the Smoke Silver Shad color pattern. A 6-pound, 6-ouncer provided some drama on the final competition day. At the time that DeFoe boat-flipped the bass — rather than carefully lipping and lifting it at the side of the boat — pundits covering the event observed that DeFoe had a chance to win, because the eventual winner, Timmy Horton, was struggling, opening a window of opportunity for DeFoe. Although he successfully got the fish in the boat, it wasn’t quite as big as his twin brutes from Day 1 and did not provide enough weight for the win. It did, however, secure his runner-up position. “That 6-6, I probably shouldn’t have swung it in the boat, but it was in the heat of the moment,” DeFoe told Bassmaster emcee Dave Mercer on the weigh-in stage. Had that fish come off in the air and fell back in the water, he likely would have finished several places lower. So he was thankful for his stout VMC hook. The other bait with which DeFoe caught bass on Okeechobee last week was a 3/8th ounce white Terminator Pro Series Jig dressed with a chunk-style soft-plastic trailer. Both Terminator and VMC are in the Rapala family of brands. DeDoe proudly wears the logos of all three on his tournament jersey. Although DeFoe would have loved to have won the tournament, he said wins occur “when it’s meant to be.” Looking on the bright side though, he noted that win, place or show, he fared much better on the Big O this time around than he did when he inaugurated his professional fishing career on the big lake in 2004. DeFoe is off to a great start in the 2017 Bassmaster Elite season. Two weeks ago, Terminator and VMC tackle helped him to a 10th-place finish on Lake Cherokee, a Tennessee reservoir located not far from his rural home north of Knoxville. Six of the top 12 finishers in that tournament were fellow Rapala pros who caught fish on Rapala and/or VMC tackle, including the winner, Jacob Wheeler. This entry was posted in News, Pro Staff, Rapala, Terminator and tagged Flippin Hook, Ott DeFoe, Rapala, Terminator, VMC. Bookmark the permalink.